A clean sweep of the three championships in the Mid-States Hockey Association, two repeat champions in the largest class in basketball, a near record performance by a wrestling team, two team wrestling champions and two four-time wrestling individual champions. Yes, it was quite a winter sport season for schools and individuals in the Town & Style coverage area. And those are just the top highlights. 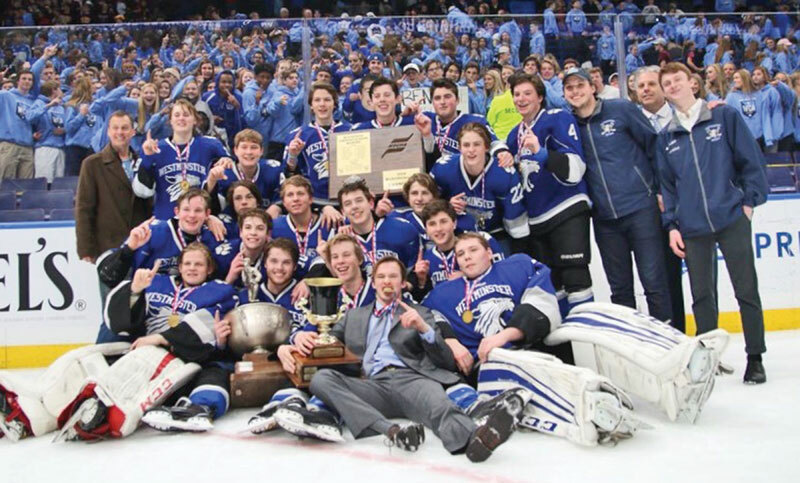 St. Louis University High, Westminster Christian Academy and Whitfield captured team titles in the Mid-States Hockey Association this winter. The Junior Bills were dominant, capturing the prestigious Challenge Cup championship for just the second time in school history. SLUH also won in 2013 and was in the championship game the previous three seasons but lost each time to CBC, which had a run of four Challenge Cup titles snapped this year. The Junior Bills finished the season with a record of 28-1, with their only loss coming against Vianney, 2-1. Defense was the strength of SLUH as it won its last 19 games, giving up just 12 goals in the process. The team capped off the season with a brilliant run in the playoffs. SLUH defeated Edwardsville in the first round, winning the best-of-two series with scores of 5-0 and 6-1. The Junior Bills did not allow one goal in their next series as they rolled by Chaminade 10-0 and 9-0. And they ended their special season with a 4-0 victory over De Smet in the title game March 13 at Scottrade Center. Henry Wagner and Joseph Winkelmann led the way in the playoffs for SLUH with seven goals apiece. De Smet was the team that actually stopped perennial power CBC, winning its series despite losing the first game 5-1. De Smet, which finished the season with a 19-7-2 record, won the second game against the Cadets 5-2 and then won the deciding mini-game 2-0. Westminster defended its Wickenheiser Cup title despite being seeded sixth among the eight teams entering the playoffs. 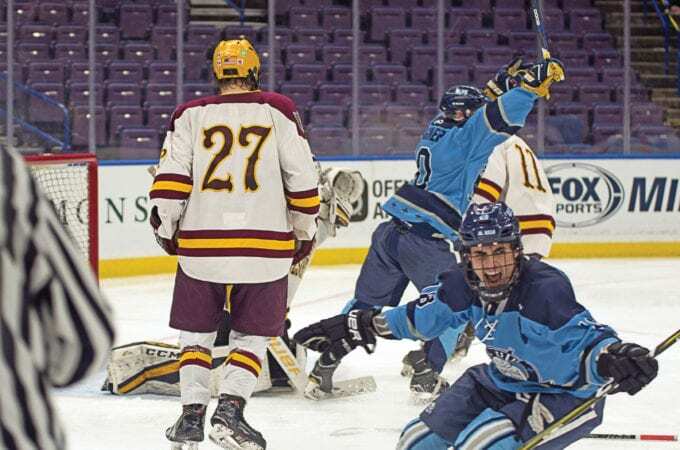 The Wildcats swept its best-of-two series against third seed Parkway South and seventh seed Fort Zumwalt South and then beat top-seed Marquette in the championship game March 13 at Scottrade Center. Levi Wright led the way in the playoffs for Westminster, scoring 10 goals. Whitfield was seeded fourth but captured the Founder’s Cup without losing a game. The Warriors beat fifth-seed Holt in the quarterfinals, top-seed Parkway West in the semifinals and second-seed Clayton in the championship game Feb. 23 at Queeny Park. An area player also led the league in scoring in the regular season. Anthony Berni had 42 goals and 27 assists for Priory, which won the Central Division regular season title. SLUH won the Municipal Division and Ladue the Suburban Division title in the regular season. The state basketball championships were held for the first time at the JQH Arena on the campus of Missouri State University in Springfield, and there was great local representation, especially in Class 5, the highest in the state. 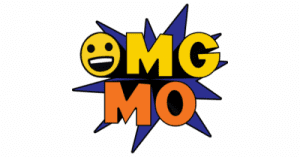 Chaminade and Webster Groves were in the final four for boys, and Kirkwood and St. Joseph’s Academy were in the final four in the girl’s tournament. The Kirkwood girls and Webster Groves boys defended their championships from last season. Kirkwood defeated Liberty 51-29 in the semifinals and had a very satisfying 67-50 win over Kickapoo in the title game. The Pioneers, who finished the season with a 28-3 record, had four players score in double figures, led by Jaidah Stewart who scored 22 points, including five of seven three-pointers. St. Joseph’s came in third in Class 5. The Angels, who finished with a 24-7 record, lost to Kickapoo in the semifinals but came back to defeat Liberty 49-48. A season of turmoil ended in a huge party for the Webster Groves boy’s team. The Statesmen had two of the premier seniors in Missouri: Carte’Are Gordon and Courtney Ramey. Each missed significant time, and Webster lost nine games in the regular season, six against out-of-state teams in prestigious tournaments. But Gordon and Ramey both were available for the post-season and led the Statesmen to their second straight state title. The Class 5 championship game was an all-area affair and pitted the two previous state champions against each other. Webster won last year, and Chaminade won in 2015-16. Webster claimed the title this year in a wildly entertaining game, 101-90. All five starters for the Statesmen scored at least 16 points, with Ramey leading the way with 26. Webster finished the season with a 22-9 record. Jericole Hellems, a North Carolina State University signee, led all scorers with 32 points. The Red Devils finished the season with a stellar 28-2 record. Hellems had 31 points in a 80-77 semifinal win over Rock Bridge. Chaminade came back after trailing 46-30 at halftime. Webster also trailed at halftime in its semifinal game but outscored Liberty 41-20 in the second half to win 81-61. Gordon, a Saint Louis University signee, had a monster game against the Bruins with 40 points. Whitfield was the other area team that made it to Springfield. The Warriors finished third in Class 3. Whitfield, which finished the season with a 23-7 record, lost to defending champion Strafford in the semifinals 67-50 but came back to win its third place game against Clark County. Aijha Blackwell led the Warriors—and the entire St. Louis area—in scoring with an average of 24.2 points per game. Whitfield had the scoring leaders in the St. Louis area for both boys and girls. Torrence Watson, who will be attending the University of Missouri in the fall, led Whitfield to the quarterfinals with an average of 31.9 points per game. Whitfield has been a dominant team in recent years, winning state titles in eight of the last 10 seasons, but it was never as dominant in winning the state championship as this season. Whitfield won the Class 1 championship with 240 points, the third highest score in state history. Seneca was a distant second with 124 points. The Warriors had five individual state champions and four second-place finishers. Michael McAteer, who is headed to West Point, won the state title for the fourth time. He had a 51-2 record in winning at 126 pounds. Other Whitfield champions included: freshman Logan Ferrero, sophomore Connor McAteer, senior J.R. Ditter and junior Zac Russell. Wade Raeman, Noah Elmore, William Boldt and Max Darrah were second-place finishers for Whitfield. The loss in the championship match for Darrah was his first of the season. CBC also had a memorable season, winning its first team championship in school history. 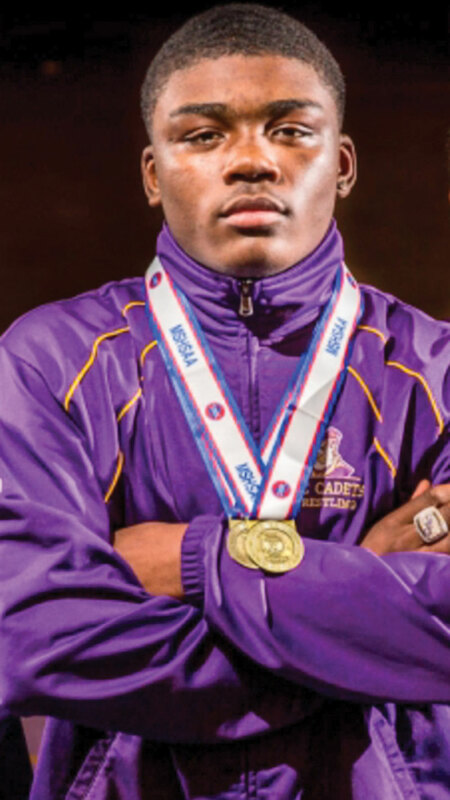 The Cadets had four individual champions, including another four-year champion. Senior Malik Johnson capped off his stellar career with his fourth state title and finished the season with a perfect 30-0 record. Johnson, who is headed to the University of Missouri, defeated Cameron Fusco of Seckman in the title match at 126 pounds. Johnson and McAteer are in a distinguished group of 29 who have won state wrestling championships all four years. D.J. Shannon won his third state title, defeating another defending state champion in one of the best matches at the state meet. Shannon defeated Devin Winston of Park Hill 3-2 at 182 pounds. 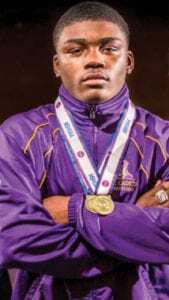 Winston was the defending state champion at 170 pounds and entered the title match with Shannon with a 44-0 record. Shannon will wrestle next year at West Virginia. Senior Cevion Severado, who also will wrestle at Mizzou, and sophomore Joshua Saunders were the other Cadet individual champions. Severado won at 113 pounds while Saunders won at 132 pounds, defeating another local wrestler, Garret Kloeppel of Parkway South, in the championship match. Chaminade senior Danny Conley was another area state champion. Conley, who will wrestle for Columbia in the Ivy League, won at 285 pounds and finished his season with a 46-1 record. Ladue’s Jake Mann was second at 106 pounds. For the first time, the state meet was divided into two classes this winter. No area teams won the team titles, although there were second-place finishes in the two classes and plenty of individual highlights from the meet, which was held at the St. Peters Rec-Plex. A freshman diver was one of the stars in Class 1. Margo O’Meara of Westminster Christian Academy won the championship, and Sophie Wojdylo of Parkway West was second. 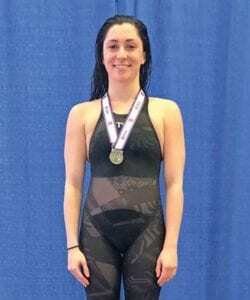 Parkway Central’s Abigail Levine was the lone individual swimming champion in Class 1. Levine won the 100-yard breaststroke, helping the Colts to a second-place team finish. Eight of the top 10 finishers in Class 1 were local teams: St. Joseph’s Academy was third, Parkway West fourth, Ladue fifth, Webster Groves seventh, Visitation ninth and Villa Duchesne 10th. St. Joseph’s 200-yard free relay team of Maddie Hernandez, Ally Duggan, Emmi Mattern and Annie Kreikemeier finished first. Hernandez also was second in the individual 50-yard freestyle, and Kreikemeier was second in the 200-IM. Lafayette’s Franceska Petrosino, who will be attending the University of Kansas, closed out her high school career in style. She won the 100- and 200-yard freestyles and teamed with Cate Behl, Delaney Thomas and Claire van Biljon to win the 400-yard freestyle relay. 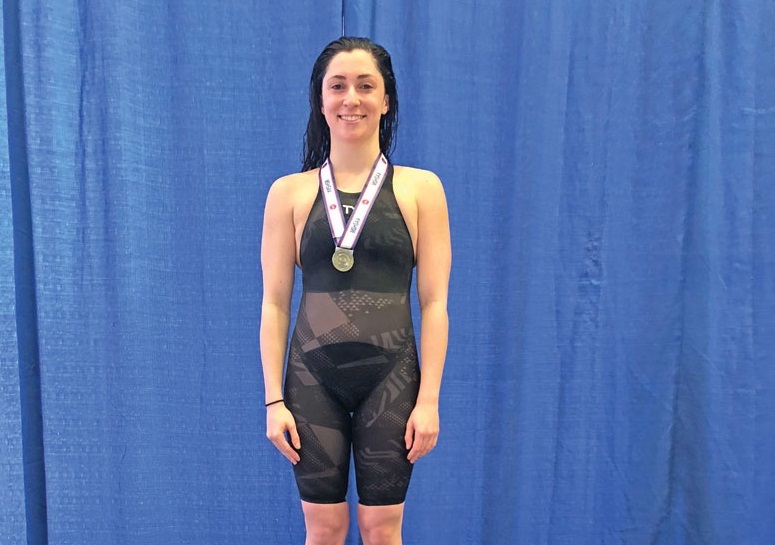 Petrosino fell just short of winning the maximum four titles at state, with her 200-yard freestyle relay team finishing second. 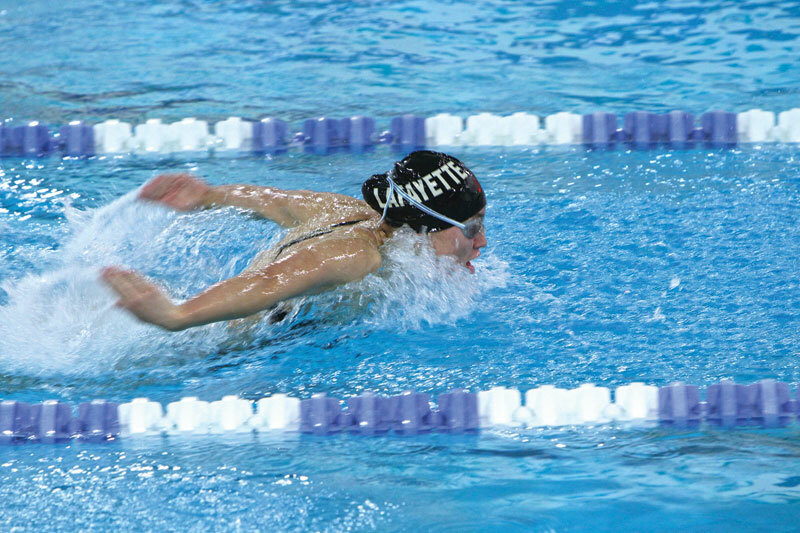 Petrosino’s efforts helped the Lancers earn second place in the team standings in Class 2. Marquette was fifth, Kirkwood seventh and Parkway South ninth. 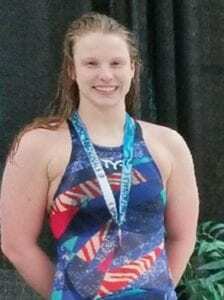 Parkway South’s Kirsten Votava had an outstanding meet, finishing first in the 50-yard freestyle and second to Petrosino in the 100-yard freestyle. 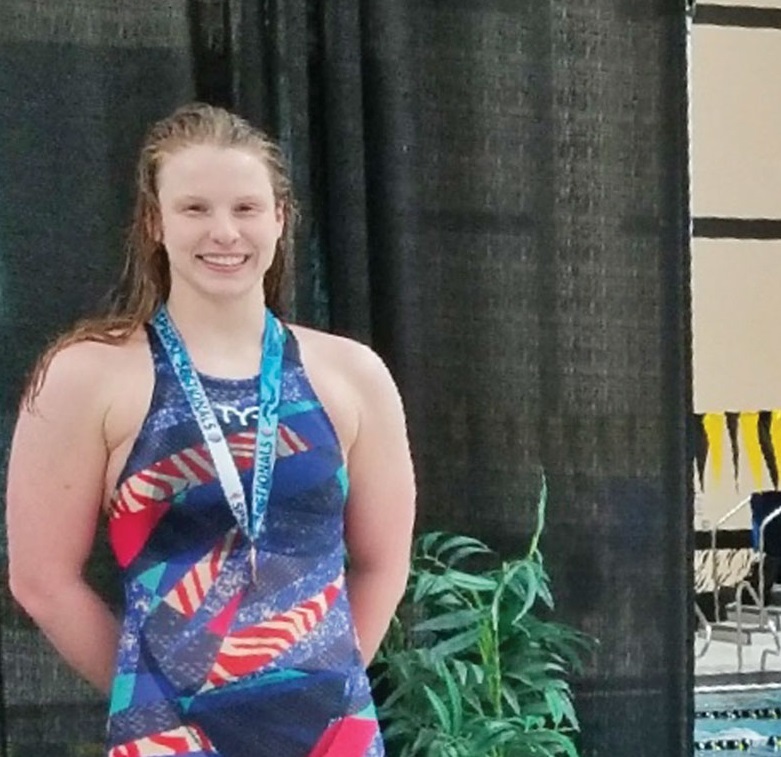 Lafayette’s Elle Christie made it a sweep of diving championships for area athletes as she won the Class 2 championship.